What do you know about the neurological disorders in cat back legs? Neurological disorders in cat back legs are one of the dangerous diseases. So, in this article, you will find some information about this disease as well as something related to it. Cats may have problems with the front and back leg when they get injured by jumping, having a traffic accident, falling into an injury, or after being entangled on something. You need to pay attention to the medical care of the cat in time, because of the risk of spinal cord injury or severe injury to the body, which will require appropriate examination and evaluation. Injury to the posterior limb is sometimes called neurological disorders in cat back legs. Before coming to the details about neurological disorders, we will discover more about what happens if a cat loses its activity ability? The ability to move and perform daily operations of cats depends on the strength of the brain, spinal cord, nerves and muscles to coordinate. This complex communication system consists of nerves in the brain that send messages about the external environment to the body, and the body sends signals to the brain about what it experiences in the atmosphere. These messages are transmitted through nerves in the spinal cord, located inside the spinal column. The nerves which are in the spinal cord and brain together form the central nervous system of the body. An injury to any part of the nerve pathway can lead to misinformation or lack of communication to the brain or body, and the inability to coordinate the movements of the body. The spine consists of a set of 24 bones called vertebrae, separated by a small buffer called the disc. Vertebrae and discs together protect the spine from damage. Injury to the vertebrae or disc can cause the nerves in the spinal cord to be vulnerable, resulting in other injuries in the nerve pathway. In some cases, cats will not be able to move their feet completely; this is complete paralysis. And in other cases, there may be contact between the brain and spine and cats will only lose strength, or will have difficulty when moving its legs, this condition is called mild paralysis - partial paralysis. There are also the cases where cats are paralyzed in all four limbs, and in some cases, cats can control movement in some of its legs, but not all. Myelin, a white lipid-containing substance that acts as an insulating layer (also known as a sheath) for some nerve fibers, can be lost through a process called myelin loss, a condition that causes myelin degeneration, leading to electrical impulse signals in the nerves lost and functional decline. Or, there may be axis degeneration with secondary myelin loss. Axis degeneration occurs when nerve fibers are injured in the myelin sheath. You will need to provide a full medical history of the cat, onset of symptoms, and incidents that may have led to this condition, such as recent tick bites, or injuries due to falling. At the clinic, veterinarians will pay close attention to the ability to move the legs, and the ability to respond to cats' reflex tests. The veterinarian will also examine the cat's ability to feel pain in all four limbs, checking the head, spine, and legs for signs of pain and alertness when touching. The veterinarian may also choose to perform additional blood tests, and spinal cord puncture, to look for specific disorders. X-rays and ultrasound can help to exclude (or confirm) cancer, but the most important diagnostic tool for identifying neurological disorders is electrophysiology - measure the electrical impulses of the tissues and cells of the body. An analysis of tissue samples (biopsies) from the muscles or nerves may provide additional information about the disease process that the cat is experiencing. Animals can often be treated, outpatient. However, cats with multiple peripheral neuropathies will have inflammation at the base of the spinal cord and are at risk for respiratory failure. These cats should be hospitalized to observe in the early stages of the disease to prevent this condition. Cats with neurological disorders in back legs should be hospitalized for intravenous fluids or drug use (outside the intestine). Cats with hypercholesterolemia who recover themselves after two to three months are given a low-fat diet. Cats which have been diagnosed with diabetes should be closely monitored for blood glucose and intake. An excellent therapeutic approach for cats with multiple peripheral nerves is physiotherapy, to encourage the restoration of affected muscles and nerve memory. It is essential to understand that the cause of neurological disorders in cat back legs can never be determined. In some cases, nerves will continue to be damaged, and the disease of the cats will deteriorate. Cats which have been diagnosed with neurological disorders should not be bred. In general, we should sterilize a cat to prevent a mating by chance. Because animals can be injured even when doing things that are entirely harmless, and even in the safest homes, there is no preventative measure for this medical problem. Keeping cats indoors, or using chains when out, will help prevent road accidents or environmental accidents. Follow the instructions of the vet carefully. If the veterinarian has prescribed medication, make sure the cat is taking adequate medicines, even after it shows signs of complete recovery. 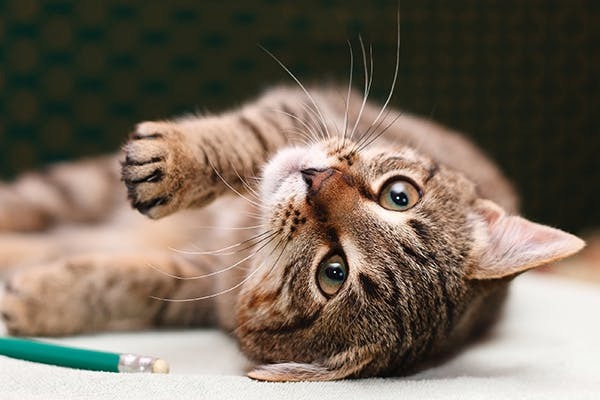 If you do have any problems with your cat, ask for help from a veterinarian, and do not give cats an analgesic, or any other medication without consultation with the veterinarians. Hope that you found necessary information about the neurological disorders in cat back legs after reading this article!